Narcissists can target anyone, but a lot of survivors categorize themselves as People Pleasers. So this article is for anyone who resonates with that description. 1 Focused on the needs of others: People Pleasers tend to have a heightened awareness of emotions of others. I don’t mean “empath” or anything like that. They’re just always aware of the moods and feelings around them. 2 Conflict avoidant: They notice potential conflicts and douse the flames before things get a chance to blow up. They recognize when others are getting upset, and do everything they can to prevent that from happening. They rehearse conversations in their mind, and learn how to phrase things to elicit the most peaceful reaction. 3 Guilt: They tend to feel guilty about way too much, even things that don’t warrant guilt. They feel especially guilty when standing up for their own needs. They are quick to apologize and take the blame, even when they aren’t at fault. 4 Self-doubt: They often doubt their own feelings and intuition, especially if those things are “negative”. For example, if someone else harms them and they try to set a boundary, they will spend days or weeks wondering if they were too harsh or secretly at fault. 5 Perfectionistic: They tend to feel like they need to do everything “perfectly”. If they make one mistake, they worry they’ve “ruined everything”. 6 Low self-worth: Rely heavily upon external validation and approval in order to feel “good enough”. Can be immensely happy when everyone approves of them, but also immensely unhappy when others are upset with them. 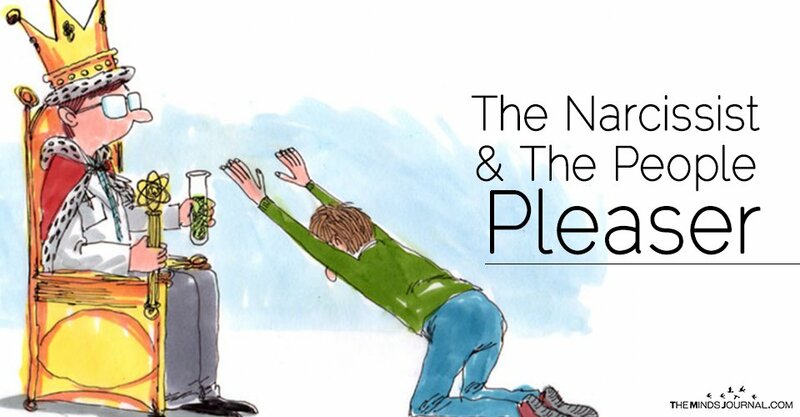 Where do People Pleasing habits come from? 3) A parent with addiction / alcoholism issues, so the People Pleaser learns to manage another person’s illness. Shifting the conversation is doable. Believing it is the hard part. People Pleasers are often very resistant to the idea of being unconditionally loved as they are (without having to do anything). Mindfulness can help explore these resistances and where they live in the body, so they can be released. How does this play into Narcissistic relationships? The combination actually makes a lot of sense. On one hand, you have a person who is completely focused on their own needs (Cluster-B disorders). On the other, you have a person who is completely focused on the needs of others(People Pleasers). If you imagine human beings as magnets, you can see why these two types would pull together.